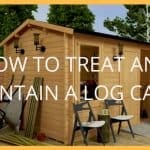 Log Cabins can be a worthwhile investment for your garden because they offer a variety of uses. Transform them into a relaxing retreat, garden office or create a home gym or studio. A log cabin allows you to enjoy time spent in the garden no matter the weather. 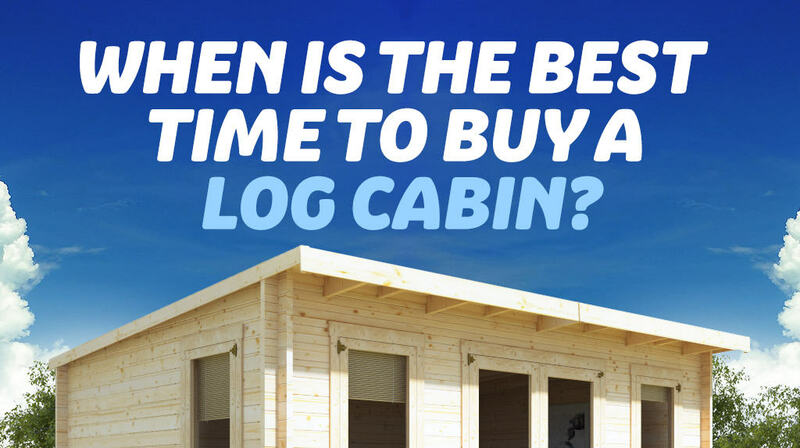 But, it’s not always easy to know when the best time to buy a log cabin is. 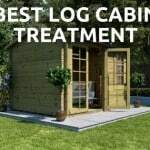 This guide explores when you should be on the lookout for a new log cabin if you want to save money and also lists some of our best sellers for you to compare. At Garden Buildings Direct, our log cabins vary in style and design, to provide our customers with more choice and versatility. We’ve categorised our top selling log cabins into warmer months and colder months, so you can find a building which is best for the time of year you want to use it. So, what is the best time to buy a log cabin? Log cabins are hugely popular in Spring and Summer, as the warmer weather entices more people outdoors and a cabin can be used as a summerhouse. When Autumn approaches and the weather gets chillier, fewer people are inclined to venture outdoors. It can also be more difficult to lay a base when the weather is wetter. However, this can also be the best time to buy a log cabin as the prices are often lower than the peak season. You wouldn’t ordinarily buy garden items such as planters and garden furniture in colder months, but some log cabins are well equipped for use all year round so you can still enjoy working or relaxing in them during Winter. 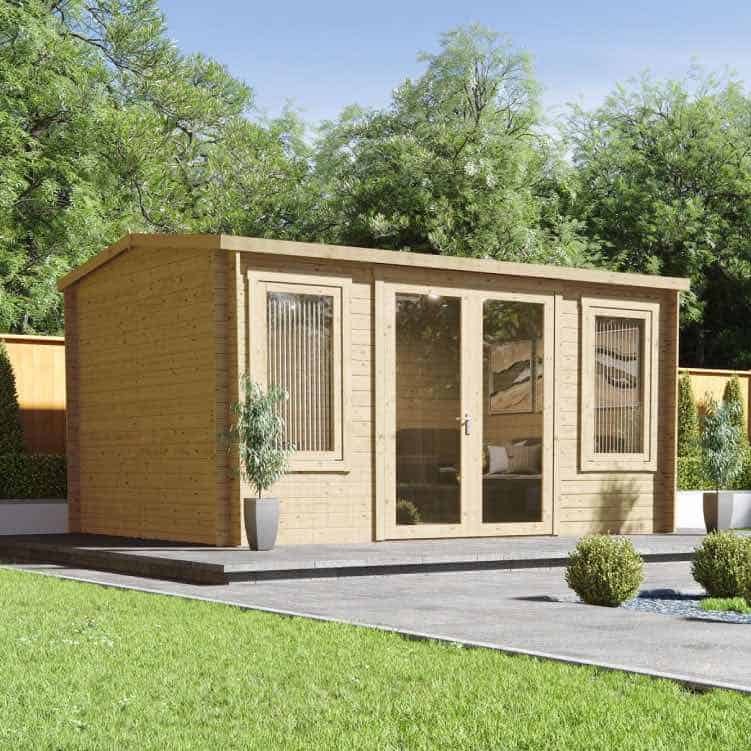 The Carmen is an ideal log cabin for Spring and Summer months as it is constructed in either 19mm or 28mm T&G cladding. Most sizes are available in the 19mm, however, the largest size comes in the stronger 28mm T&G. Ideal for use as a summerhouse, the building perfectly complements a modern garden due to the contemporary pent roof and long doors and windows. If you want to enjoy views of your garden while relaxing in Summer months, the Sasha log cabin makes a great addition. The traditional apex roof and modern windows complement any garden setting and the choice of 19mm or 28mm cladding ensure suitability for use during warmer months of the year. 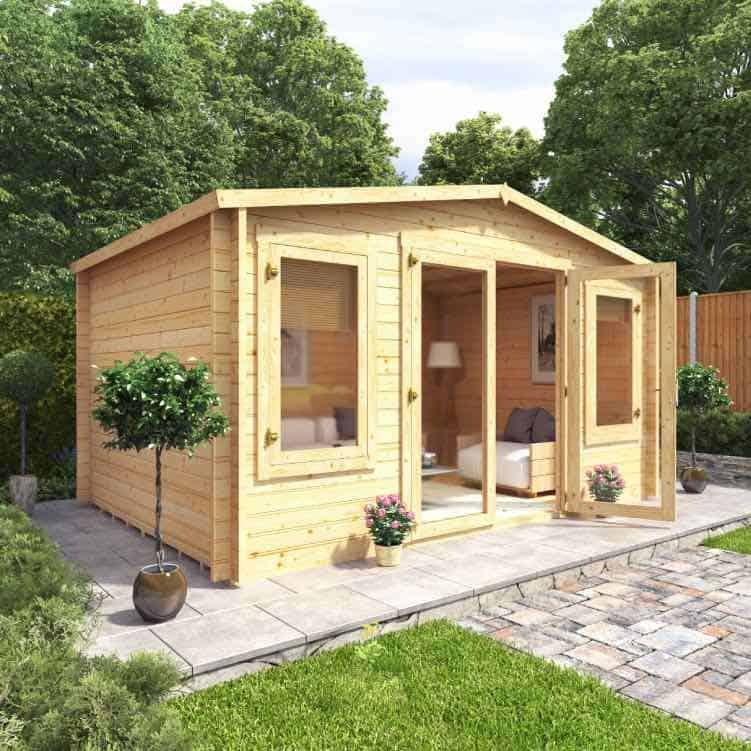 The Miller log cabin is great for anyone looking for a traditional summerhouse for their garden. The cabin combines classic features such as the apex roof and Georgian windows to sit perfectly in a traditional garden setting. Choose from a range of sizes, as well as 19mm or 28mm T&G cladding. This log cabin is designed for Spring and Summer use as a summerhouse but has the option of a lean-to for extra garden storage. You can also choose from Modern or Georgian windows in either SAN or Double Glazing to suit the building’s needs. The building comes in either a 19mm or 28mm T&G cladding. This premium log cabin has a range of exciting features which make the garden building a statement piece of architecture. 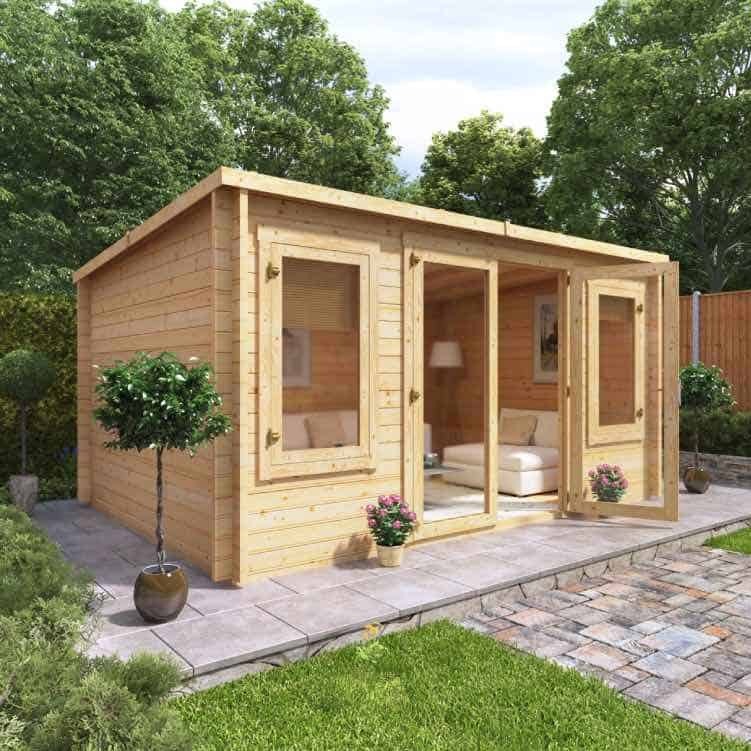 Ideal for use a garden office, it comes in a choice of 35mm, 44mm, and 70mm cladding thicknesses. For use in Spring, Summer, and Autumn, 35mm and 44mm thicknesses are suitable. If you want to use the log cabin all year round, upgrade to the extra solid, double tongue 70mm option. The Winchester is a classically designed log cabin which has a modern overhang for shade during summer months and shelter from the rain. If you opt for the 70mm cabin, you can use the building all year round. The 44mm cladding will be suitable for use during Spring, Summer, and Autumn, and the 28mm cladding is best for use during Spring and Summer months. 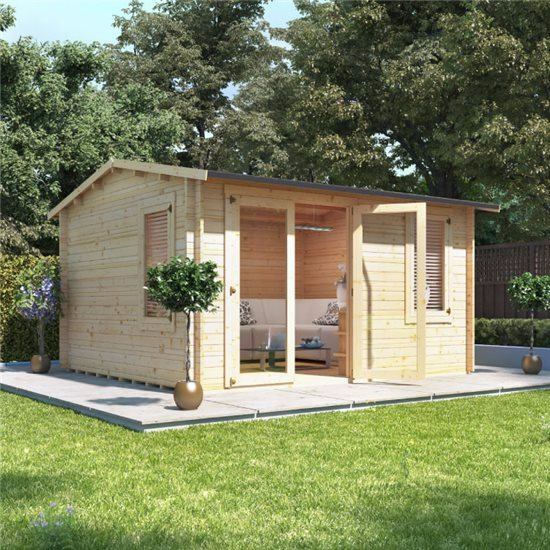 The Kent is a cabin which is ideal for use as a garden office. The multi-room design means you are provided with office and storage space, and the building comes in a choice of 28mm, 44mm, and 70mm thicknesses to suit your needs. The 70mm is ideal for use all year round, the 44, will be equipped for Spring, Summer and Autumn and the 28mm cladding is only designed for summer use. The Devon log cabin comes a range of customizable options to choose from. Available in every log thickness, you can find a building which suits your needs. It has a stylish reverse apex design long windows which can be Georgian or Modern depending on your preference. 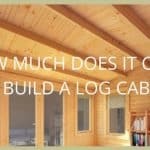 Purchasing a log cabin at the right time can save you money and time. But choosing the right cabin for the time of year is also important. If you only intend on using the building in the summer months, then you might want to wait until the weather is better as laying a base can take longer when it’s wetter. 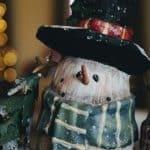 However, if you want to save some money, you should take a look at cabins during winter months! For more log cabin information, here is our log cabin ultimate guide.